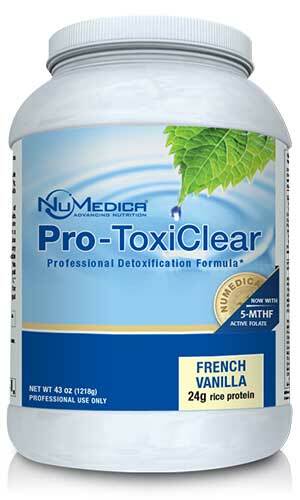 NuMedica Pro ToxiClear is an innovative supplement designed to support advanced detoxification. Detoxification is the process by which your body can remove toxins that are potentially harmful and certainly unwanted by your system. 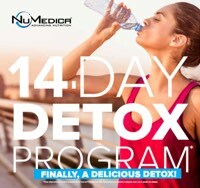 NuMedica has created this advanced formula with targeted nutrients that are known for their ability to enhance the detox process. With its 24 grams of high-quality, hypoallergenic rice protein, NuMedica Pro ToxiClear is ideal for supporting your liver during the detox process. NuMedica Pro ToxiClear contains an extensive array of nutrients that support the detox process. Your liver is hard working, so supporting it with vital nutrients makes healthy sense. Every day our bodies face toxins-from our foods to our environment. Before these toxins can detract from our health, it's up to our liver to flush them from our body through the process of detoxification. 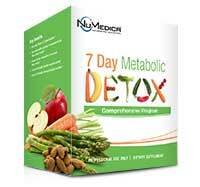 NuMedica Pro ToxiClear supports the liver through each phase of detox to help remove harmful toxins from the body before they can wreak havoc. NuMedica Pro ToxiClear contains a nutrient-enriched formula that supports detoxification and also provides gastrointestinal support by restoring the pH balance of the gut. Its rice protein is low in heavy metals and features an excellent amino acid profile. Dietary protein has the added feature of enhancing muscle rejuvenation and repair while complementing weight loss. Directions: Stir or blend 2 scoops (58 grams) into 12 ounces of water or juice or as directed by your healthcare practitioner. Other Ingredients: Rice protein, natural vanilla flavor, guar gum, salt, stevia, xanthan gum. DimaCal, TRAACS and The Albion Medallion design are registered trademarks of Albion Laboratories, Inc. Malates covered by Albion International, Inc., U.S. Patent 6,706,904 and patents pending.